The place is groovy. The vibe is spirited. 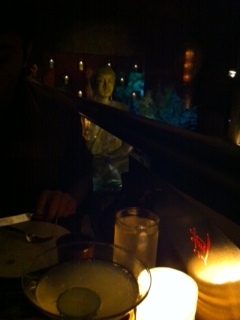 The Buddha statue is stupefying (for the size of it, in a Manhattan restaurant, for sure). The food is not. 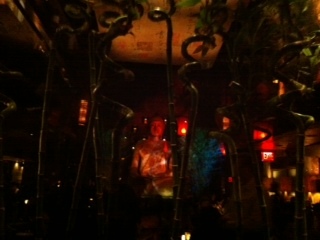 I was disappointed with the food, more, because Buddakan was my yardstick for collation here. Not that I was not aware of the lack of vegetarian options before I got in, but also that I thought a restaurant this stature would dish tasty food, anyway. 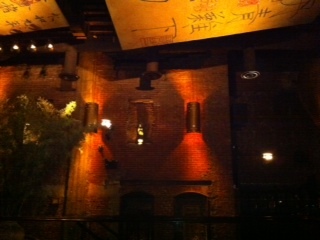 The place was originally a stable, then a movie theater which was converted into this restaurant. The 16 feet tall Buddha statue is on a small pool with big enough fish in it. The backdrop against the Buddha – big niches with big candles is classic. I believe the light over it dims and brightens over time (from the pool). The husband and I went there to celebrate five years of engagement. 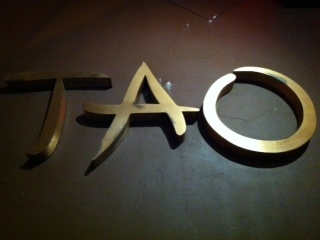 Tao is (in)famous for keeping you waiting in spite of having a reservation. We went there on a Tuesday at 6:30. The place was already buzzing with people – mostly office going crowd – seemed sophisticated. After we announced ourselves, I’d say we had to wait for about 20 minutes. This is what I saw from the lounge area. The lounge area was packed as well, where we waited. We were both tired and jet lagged from our recent India visit, and were debating whether to get a drink or not, when our thing buzzed and we left to be seated. We were seated on the upper level, which I thought was very cool, plus not in the center, just by the balcony grill – we had good views of the entire restaurant. The ceiling is very high, and the speakers are up there on the walls in the niches, so the music was loud, but not blaring. They had a live DJ. The music seemed to have an east Asian touch to it, is what I thought, but the husband did not agree. We started with Tiger Lily for me and warm sake for the husband. Both were good, but nothing out of the ordinary. The Tiger Lily drink did not seem as fresh as the suggestion of the cucumber in there hinted. It had German liquer in it, and it reminded me of lychee martini. For appetizers, we got dumplings and the husband got satay with peanut sauce. The peanut sauce was delicious – warm – the first time I’ve had warm peanut sauce. The dumplings were tasty, but not hot. Pre made? 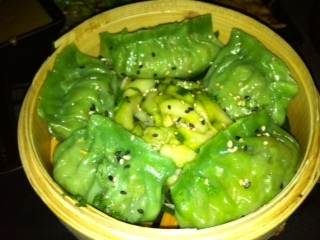 The crunchy pickled cucumbers they served with the dumplings were the more fun part. I finished it all. 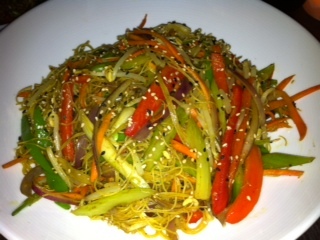 For the main course, I ordered vegetable fried rice and Singapore mei fun noodles. And I must say neither of them were fun. The colours of the vegetables looked very good. So did the rice. But again, not piping hot. That’s always a turn off for me. 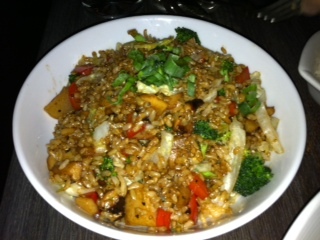 I’ve had better Singapore noodles at Gobo, and for fried rice – nothing beats Buddakan so far. But this one was not even one of the better ones. I was held late at work and so did not get a chance to pick up gifts for the husband (greetings, I already did the previous evening. To give you a picture – this day is February 15, after Valentine’s. We have not ‘celebrated’ Valentine’s in the past four years, but always made it up with this day). 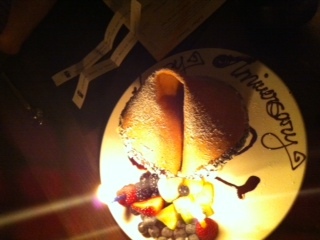 He suggested trying the giant fortune cookie, which is their signature dish, or doughnuts with different sauces. I told him to get whatever he thought would be better. 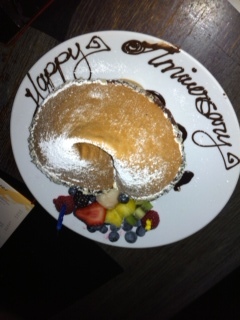 Then he realized why I was taking so long on the menu – still not sure when did I get the time to order the dessert. So, it was indeed giant. But the mousses were not that great. And again, not that cold. Seriously? We tried eating as much as we could, which was about ¼ of what was served. It is totally a place to go with groups. But if you are a vegetarian, uhm, you can skip it, unless it is for the feel, and not food. The best thing I liked about the place was the Buddha statue. Three and a half stars, purely for the feel.